In Rome, the city itself is the party. You can find clubs, and bars in every corner and alley, though there are some areas that are more concentrated and famous than others. The main centro storico nightlife districts are listed below. Are you the type of person who likes to dance the night away? The biggest concentration of nightclubs lies in the Testaccio district, where a plethora of small venues offer dancing and concerts. Akab and L’Alibi are two of the most popular dance clubs in the area. The gay scene is alive and kicking and accounts for many of the more avant-garde night spots. 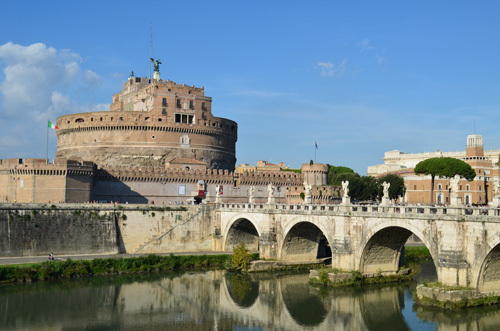 Castel Sant’ Angelo…mystical, historic and relaxing. Vatican City (Citta del Vaticano), also known as with the Holy See (Santa Sede), is the latest and only current Papal state in existence and the temporal seat of the Pope, head of the worldwide Catholic Church. Situated within the city of Rome in Italy, the Vatican is the world’s smallest state. This wonderful palace , built in 1744-1748 for baron Rondanini, was restructured and furbished in the 1760s as a living museum to show off the wealthy Lombard family’s collection of art and antiquities. After the Rondinini family sold the house in 1801 (there were no heirs) it was owned by a string officials and dignitaries for the next century. Many of its antiquities were taken abroad during that period. In 1904 there were some updates to the building and in 1946 it fell into financial hands when the Banca Nazionale dell’Agricoltura bought it. One of the antiquities to be taken away was the Rondanini Medusa, a Roman-era copy of an original Greek Gorgon’s face (with snakes) that adorned the shield of the colossal statue of Athene that once stood in the Parthenon. Our guide told us that John Paul Getty was involved in the Medusa’s departure. Piazza di Spagna. One of the most popular meeting places in Rome. The elegant staircase,built between 1723-1726, consists of 137 steps over twelve different flights.